Is there anyone else who thinks this weather is a little too hot? I’m melting away in my hometown right now and it’s been like this for a few weeks! Oslo isn’t used to 25-30 degrees for longer periods at a time haha. It’s aaaaalmost to warm to read, so it was good that I had picked a good read right about now! I’ve just finished The Lion Woman and it was a brilliant story! PS. The book is in the process of being translated into English as we speak! Originally it is Norwegian and has been translated to several other languages, but not English, until now. Eva isn’t like all the other children. From the moment she entered this world, a cold winter night, she was different; she’s furry, all over her body, like an animal. It is a condition known as hypertrichosis. 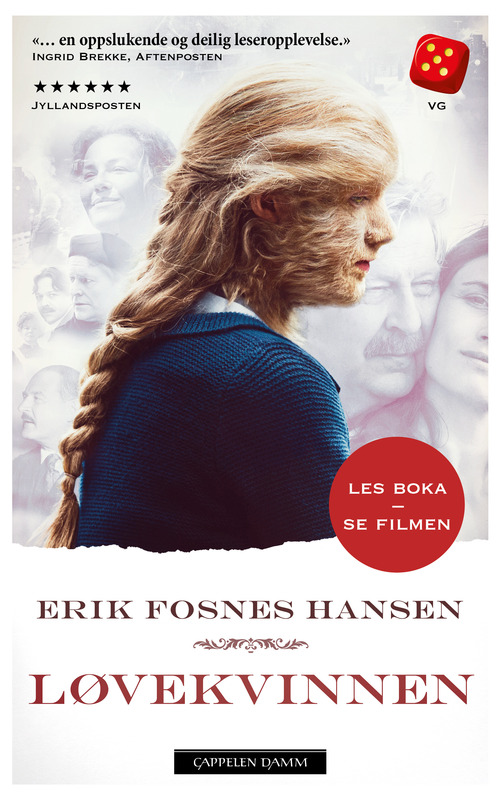 In post World War 1 Norway she grows up in a little country town, a town where gossip and rumors about the newborn child of the Station Master quickly spreads. Her father doesn’t want people to talk and stare, so for most of her early years, Eva is alone. She has no friends and she lives secluded behind her curtain. This is Eva’s story. It’s the story about a child, so different from everybody else, who just wants to live her life and fit in. Certainly, there must be somewhere she fits in? Hansen’s writing style is very good! He leaves clues hidden between the lines which make the reading entertaining. The way you interpret these clues will color the way you read the rest of the book. I like this kind of reading because it’s challenging enough without you having to grind your head to understand what Hansen wants and where the story and plot are heading. The ending of the book (I won’t spoil I promise!) leaves you with a lot of questions, and I was wondering if there is a new book coming? With open endings like this, I often try to imagine or fantasize about how the story eventually will end. In my imagination, Eva joins a circus or a traveling band of peculiars and shows the world that beauty is found within. You may not agree with me, but that is the beauty with open endings and different people! My ABSOLUTE favorite character in this book is named ‘Gnisten’ (‘Spark’ when translated into English). He is one of a kind indeed. Since I’m the Harry Potter fan I imagine him as one of the Weasley’s. Gnisten has flaming red hair, he is tall and lanky and he works as a telegraphist for Eva’s father. Eva and ‘Gnisten’ become friends under quite dangerous circumstances and it’s when Eva and her nanny, Hannah, go to thank ‘Gnisten’ that he and Eva become friends. He is able to see the child she is underneath all the fur and he treats her like a regular person. The way ‘Gnisten’ treats Eva is just so beautiful and Hansen has described it so well! It’s touching to read and, it sounds cliché I know, it gives me hope for the human species even though this is fiction. This story takes place in a time where the countryside in Norway was more Christian than it is today and most things that did not follow the faith were frowned upon. The fact that ‘Gnisten’ understands that Eva might be lonely due to her looks and that he doesn’t care, but always makes sure that she feels seen when he is around. I wish there were more people like ‘Gnisten’ in this world. Eva’s father is another thought-through character in this book. In the beginning, you get the sense that he doesn’t care much for his daughter, but through actions in her life we can sense that maybe her father doesn’t have a cold heart at all. It’s never said explicitly, but it is hidden within the clues Hansen shreds all over the book in between the lines. There is a movie made in 2016 which is based upon this novel. I love that they used one of my favorite Norwegian actors, Rolf Kristian Larsen, as ‘Gnisten’. In my opinion, he is absolutely perfect for the role! I also found it funny that they have used actors of Norwegian, Danish and Swedish origin and they all speak their native language in the movie. Even though there are subtitles, it sounds funny to me, and I’m not sure this fact is obvious to non-Scandinavian people. The film takes the story further and I’m very pleased with how the movie turned out compared to the book. You don’t have to have read the book before you see the movie, but the meaning of the story is much deeper if you have. The loneliness that Eva experiences as a child are very well portrayed and the whole story comes together in a very nice way. The movie also shed lights on some of the mysterious clues left between the lines in the book and this adds some extra excitement to the story. I would highly recommend all my Norwegian, French, German, Swedish, Latvian, Turkish, Spanish, and Dutch (soon my English readers too!) readers to read this book if they are looking for a good read!